Wow, I don't know where the last week went. I guess I do I was busy preparing for Christmas day and then this weekend I spent stamping away on projects for Stampin' Up! leadership and also taking down all the Christmas stuff around the house. I thought I had posted our Christmas Card last week but I guess I dreamed it. I wanted to share it now because although simple, I really like the way it turned out. We normally spend Christmas at Walt Disney World. This year, Ron wasn't able to get Christmas week off so we went the week before. We still had a wonderful time but I have to say (and I know it sounds strange), it was weird being home on Christmas day! We've gone to WDW for Christmas 5 out of the last 7 years! 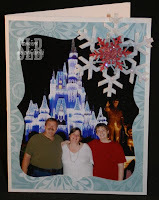 Our card reflects our family time at WDW. The picture was taken by one of the Photopass photographers. For anyone going to WDW, I highly recommend buying the Photopass CD. It's absolutely the best thing we've ever done. I used the Ski Slope DSP, Scandinavian Season stamp set, Felt Flurries (I added Dazzling Diamonds glitter to them), and the Silver cording. 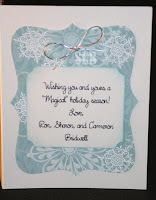 The card was done using Shimmery White Cardstock. Because I didn't want to "waste" the inside part of the frame, I used it to mount our greeting on inside the card! I embossed snowflakes from the Scandinavian Season stamp set on the Ski Slope paper to give it some extra dimension. Because they were fairly simple, I really enjoyed making them for my friends and family! 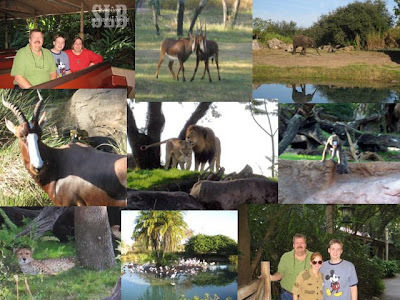 This year we had a really fun time and the best thing of all was getting chosen to be the First Safari Family of the day at Animal Kingdom. While I enjoy all of the Disney parks, over the last few years Animal Kingdom has become my favorite place to spend time. I think I figured it out on this trip, it's not a "typical" theme park. It's much less frantic and I enjoy the slower pace, the lush landscaping, the Broadway caliper shows, and of course the SAFARI! It's probably as close to the real thing that I'll ever do and for me, it's good enough. Being chosen to be the First Family was a dream come true! We got our own personal safari with a driver and a guide. We got a "backstage" tour which was perfect for us. We've been on the safari probably 25+ times since the park opened 10 years ago. Every visit we ride it at least 2-3 times. I love this ride because it's always different. You just never know what you'll see. When we got on the bus, we told our guide and driver that we didn't need all the pre-recorded stuff that we knew the drill and they seemed thankful for that. That's when they suggested a "backstage" tour. They talked a lot about the animals on the trip and which were their favorites and why they loved them so. The main thing I loved was seeing how much they loved their jobs! They would slow down for us to take pictures (of course this was the FIRST time I didn't have my big camera with the zoom lens) and we just had a marvelous time. Our guide was from originally from Plano (about 45 minutes from our home) so that was kind of fun as well. After we returned back to "camp", they presented us with a little pass that said we were The Kilimanjaro Safaris Honorary Family and it entitled us to return to the safari as many times that day and use the Fast Pass line! That was way cool! People often ask me why we love taking trips to Walt Disney World so often, I guess it's because it's always magical, you get to be a kid again, and the outside world just seems to not exist while you are there. I hope you enjoy the photos as much as we enjoyed the safari! Sharon, you always seem to be having so much FUN! I love your Christmas card. That die cut really adds a nice touch. I'm glad you had a good Christmas. See you in a few months at retreat! Glad you had a good time at Disney again this year! I love the card! And yes, you always do seem to have so much FUN! Happy New Year!